Mr. Zager builds his guitars using only genuine Fishman electronics, the #1 rated electronics for guitars today. Our acoustic electric models allow you to plug into an amplifier or PA system and play them like full electrics essentially giving you two guitars in one. Unplugged they sound exactly like our full acoustics so there’s no acoustic sound loss. They also have built in auto tuners that tune your guitar in a fraction of the time it takes using conventional tuning methods. Our touring artists love this as it saves time on stage and for beginning players the auto tuners actually train your ear so you develop a perfect sense of pitch. It’s called the “private recording studio” that’s built into your guitar. 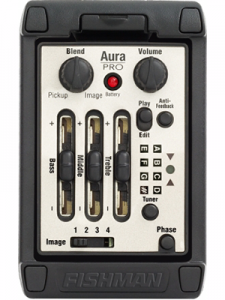 Fishmans Aura pro is just like any other guitar electronics system in that it allows you to plug into any amplifier or PA system and play it like it an electric. What makes it different from all other systems is it’s patented digital sound imaging system. Fishman’s new Aura Digital Sound Imaging System allows you to download thousands of sound images directly from the Fishman online library that have been professionally mixed in Fishmans multi-million dollar recording studios. You can select from images mixed specifically for your Zager as well as thousands of others depending on the sound you’re looking for. Denny used to spend countless hours in studio time dialing in the perfect sound for his guitars. Fishman’s Aura Image Gallery Software (included) does this for you by allowing you to select from thousands of images on their online library that will give you the sound you want no matter what you’re looking for and downloading them onto your guitar via USB cable. Read the reviews, talk to the pros, and you will see this system dominates every guitar electronics package on the market today. Comes with USB cable. Uses one 9 volt battery (included). Available on ZAD900CE, ZAD900CEOM, ZAD80CE Aura, ZAD80CEOM Aura. The Presys 80 is similar to our Aura 100 but without it’s patented imaging system. If you’re looking for a solid high end electronics package to use with an amplifier or PA system this is the #1 choice in acoustic guitars today. It’s designed to offer maximum control, performance and quality in an unobtrusive format. The Presys 80 features Volume, Bass, Mid and Treble controls, a Phase switch to control feedback, and a built-in tuner with LED display. Low battery indicator, low profile control knobs, and a unique pivot design for easy access to the battery compartment. Uses one 9 volt battery (included). 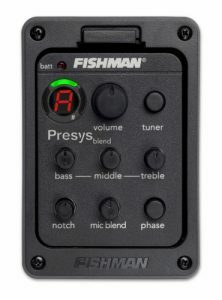 Fishman’s Isys Onboard Preamp Systems are dedicated to providing maximum value in a small footprint. These preamp systems feature Volume, Tone shaping, and Phase controls; a pre-wired Fishman Sonicore pickup and low profile slider controls. Also included are a low battery indicator and a separate battery box. Uses one 9 volt battery (included). 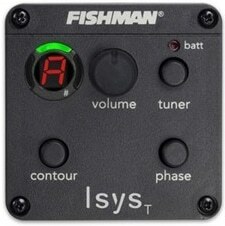 Fishman’s Isys 20 Onboard Preamp Systems are dedicated to providing maximum value in a small footprint. These preamp systems feature Volume, Tone shaping, and Phase controls; a pre-wired Fishman Sonicore pickup and low profile slider controls. Also included are a low battery indicator and a separate battery box. Uses one 9 volt battery (included). 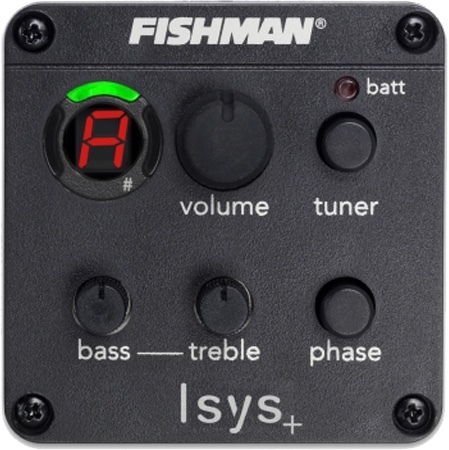 Fishman’s Isys 10 Onboard Preamp Systems are dedicated to providing maximum value for a smaller price. 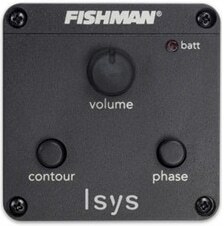 The Isys 10 features Volume, Bass and Treble control with low profile slider controls. Also included is a low battery indicator and a separate battery box. Uses one 9 volt battery (included).